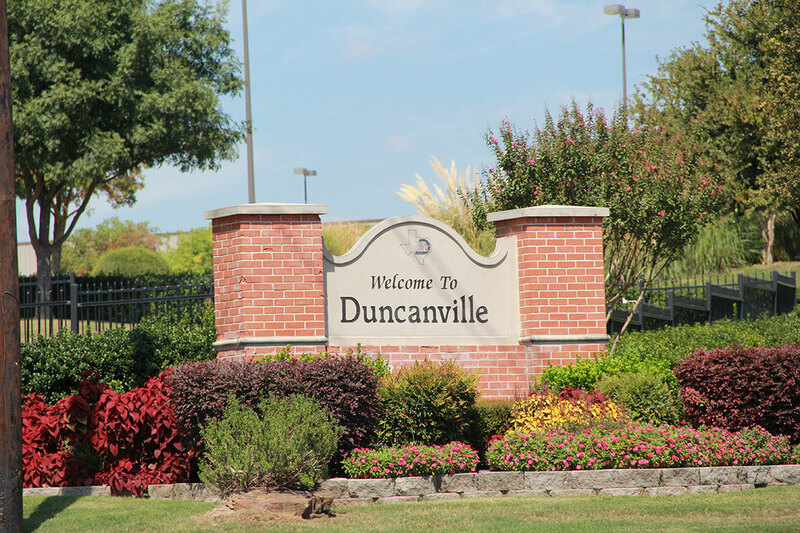 The City Secretary is the public information coordinator for the City of Duncanville. Public Information is any information that is collected, maintained, or assembled by or for a governmental entity, regardless of format. The Texas Public Information Handbook, will inform you of everything you need to know about accessing governmental records. 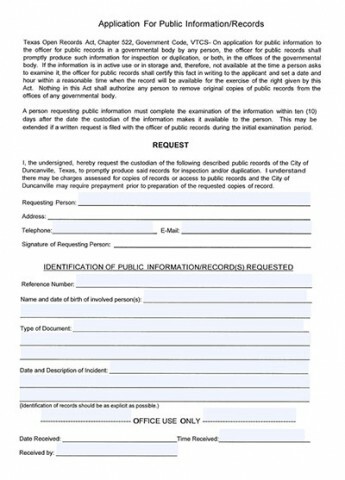 Need to request Open Records from the Police Department? Requests must include enough description and detail about the information requested to enable the City to accurately identify and locate the information requested. The Act requires the City to provide copies of existing records, but does not require the City to create records that do not now exist, do any research, or answer any questions. The request should also include the requestor’s contact information: name, address, telephone number, and e-mail address. It is important that the contact information provided is accurate to avoid delays. In some cases, the City may need to contact the requestor to clarify the request. If we need to contact to verify information the 10 days start over. Texas Open Records Act, Chapter 522, Government Code, VTCS- On application for public information to the officer for public records in a governmental body by any person, the officer for public records shall promptly produce such information for inspection or duplication, or both, in the offices of the governmental body. If the information is in active use or in storage and, therefore, not available at the time a person asks to examine it, the officer for public records shall certify this fact in writing to the applicant and set a date and hour within a reasonable time when the record will be available for the exercise of the right given by this Act. Nothing in this Act shall authorize any person to remove original copies of public records from the offices of any governmental body. A person requesting public information must complete the examination of the information within ten (10) days after the date the custodian of the information makes it available to the person. This may be extended if a written request is filed with the officer of public records during the initial examination period. I, the undersigned, hereby request the custodian of the following described public records of the City of Duncanville, Texas, to promptly produce said records for inspection and/or duplication. I understand there may be charges assessed for copies of records or access to public records and the City of Duncanville may require prepayment prior to preparation of the requested copies of record. Be specific regarding dates, time, periods and name(s). Download the PDF file to your computer, print it and fill it out completely. The Public Information Act requires that the City promptly produce the public information and that requests must be accomplished in a reasonable time period. There is often a misconception that the records must be produced within ten days. In some instances, records can be produced in less than ten days, but in other cases, which entail producing a substantial number of documents, it may take several weeks. If it will take longer than ten business days to provide requested records, the City must certify in writing to the requestor when (within a reasonable time) the information will be available. If additional information is requested for clarification from the requestor, the ten days starts over. Is there a charge for my Open Records request? The first option should be that if it’s a simple request, the responses may be provided to the requestor by email at no cost. We are required to let you know the least expensive way to obtain the info i.e. by e-mail. The requestor may receive a copy of the records by mail if they send a payment in advance for each copy at 10 cents a copy. The requestor may come to City Hall to pick up a copy of the record and pay 10 cents per copy. There are a lot of rules as to whether we can charge more than the 10 cents per page, including if we spend over a certain amount of time searching, gathering and copying the information; if it will require going off site to retrieve the record(s); if there will be IT programming services required to produce the record, etc. If any of these are the case, we provide the requestor with an estimate before going forward so they approve the expense or if they want to revise their request. Once a request for clarification or the cost estimate is provided, the request starts over.